Chemtrails are in full swing on the east coast of the US to the point that blue sky days are nearly non existent. It seems the chemtrail planes are not only very busy on the East Coast but also in the skies over Oldsmar in Florida, yet it seems that the crews of the chemtrail planes are very creative as during the spraying operation above Oldsmar on Jun 2, 2016, suddenly a cross appeared in the sky, captured by La nueva era de la tierra. 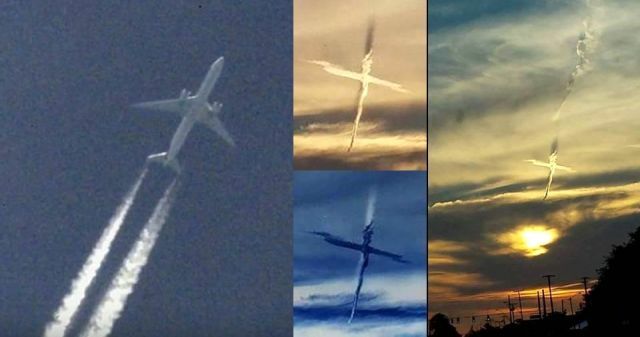 We can say the cross is a warning from Heaven to stop immediately with spraying chemicals and biological agents into the air, but it is more likely the result of two trails which cross each other during the spraying operation. Nevertheless, whether the cross is a sign from God or accidentally made by chemtrail planes, it gives an uncomfortable feeling, knowing that they are spraying toxic metals and chemicals above your head. The footage below, recorded on June 3, 2016, shows the aerial chemical assault on the East Coast. Chemtrail activity starts at 1.50 Mark.